There are two very different pictures of the students roaming the hallways and labs at New York University’s Tandon School of Engineering. At the undergraduate level, 80 percent are United States residents. At the graduate level, the number is reversed: About 80 percent hail from India, China, Korea, Turkey and other foreign countries. The Tandon School — a consolidation of N.Y.U.’s science, technology, engineering and math programs on its Brooklyn campus — is an extreme example of how scarce Americans are in graduate programs in STEM. Overall, these programs have the highest percentage of international students of any broad academic field. In the fall of 2015, about 55 percent of all graduate students in mathematics, computer sciences and engineering were from abroad, according to a survey by the Council of Graduate Schools and the Graduate Record Examinations Board. In arts and humanities, the figure was about 16 percent; in business, a little more than 18 percent. The dearth of Americans is even more pronounced in hot STEM fields like computer science, which serve as talent pipelines for the likes of Google, Amazon, Facebook and Microsoft: About 64 percent of doctoral candidates and almost 68 percent in master’s programs last year were international students, according to an annual survey of American and Canadian universities by the Computing Research Association. In comparison, only about 9 percent of undergraduates in computer science were international students (perhaps, deans posit, because families are nervous about sending offspring who are barely adults across the ocean to study). Many factors contribute to the gap, but a major one is the booming job market in technology. For the most part, Americans don’t see the need for an advanced degree when there are so many professional opportunities waiting for them. For some, the price is just too high when they have so much student debt already. “You can believe that U.S. bachelor’s students, if they’re good, can go get a job at Microsoft or Google with a bachelor’s degree,” said Edward D. Lazowska, a professor of computer science at the University of Washington. Hadi Partovi, a tech investor, received his master’s in computer science from Harvard in the 1990s. His roommate did not. They both got job offers from the same company. “Master’s grads are valued more, but not enough more for American students to get a master’s degree,” said Mr. Partovi, a founder of Code.org, a nonprofit that promotes computer science in grade school and high school. Universities and employers are eager to tap the pool of international talent that helps them stay competitive globally, and graduate programs have a financial incentive in attracting them: Demand from abroad is so high, administrators don’t see a need to offer as much tuition assistance. There’s concern, though, that the current climate around immigration could jeopardize that flow of talent. Incidents of xenophobia, hostile political rhetoric and President Trump’s attempts at banning travelers from some Muslim-majority countries may be weighing on the minds of potential applicants. The Thayer School of Engineering at Dartmouth, for example, saw a 30 percent decrease in international applications to its professional master’s program for this semester, according to the dean, Joseph J. Helble. Dr. Helble surveyed more than two dozen engineering deans earlier this year, and three quarters of them said they, too, had seen significant drops in international graduate applications. But enrollment, he said, was not off. Still, trends are not clear. Dan Spaulding, who oversees human resources at Zillow Group, the online real estate company, said that in specialized areas like machine learning and artificial intelligence, his company favors graduate degrees, but for the vast majority of its technical jobs, a bachelor’s degree in computer science is adequate. He said he has heard concerns from students and managers about an international chill, but for now the supply of students with computer science skills hasn’t been affected. In 1994, only about 40 percent of students who were enrolled in computer science Ph.D. programs were from outside the country, according to the Computing Research Association survey. The balance of computer science graduate programs began to tilt toward so-called nonresident aliens in the late 1990s, when well-capitalized dot-coms began scouring for programmers, sometimes encouraging summer interns to drop out of school, Dr. Zweben said. 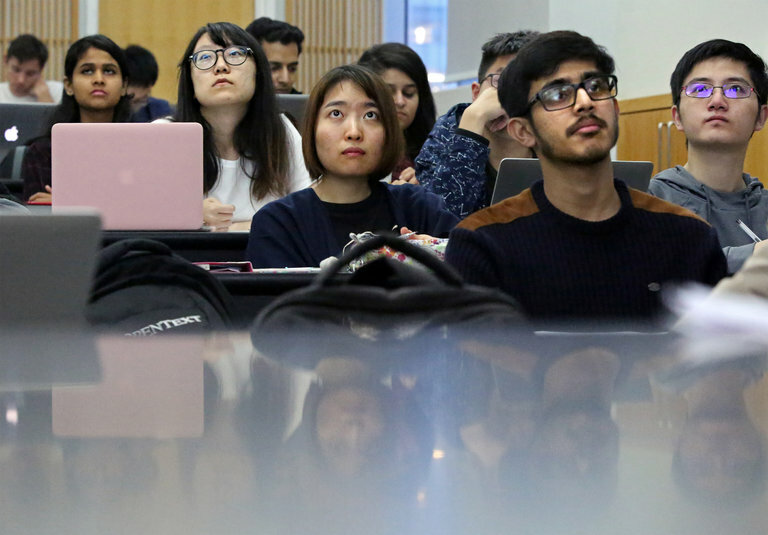 Students from other countries have long seen graduate school as their best path to employment and residency in the United States, and for the industry connections they are not likely to find in their home countries. “It’s easier to get access from here,” said Ms. Joshi, who is president of the N.Y.U. finance club. She wanted to attend N.Y.U. so she could merge her background in information technology with her interest in the financial industry. She has regular exposure to industry speakers and recruiters. Her decision paid off. Ms. Joshi, 25, has accepted an offer to work in risk management at American Express once she completes her master’s. She will apply for Optional Practical Training, a program that allows her to work in the United States for a year, with an option of extending her stay for up to another 24 months.It will be up to her employer whether it wants to sponsor her for an H1-B visa after that, allowing her to stay longer. President Trump has ordered a review of the H1-B program, and floated the idea of adjusting the current lottery system to favor higher-paid, higher-skilled workers. The Tandon School recently started “A Bridge to N.Y.U. Tandon,” aimed at preparing students with non-STEM backgrounds like liberal arts for master’s programs. Katepalli R. Sreenivasan, the dean, believes this could attract Americans who have not yet found decent jobs.